In 2017 Oral-B have launched the Pro 2 2500 and the Pro 3 3000. These are replacements to the Pro 2500 and the Pro 3000 being reviewed here, note the extra ‘2’ and ‘3’ in the respective product names. 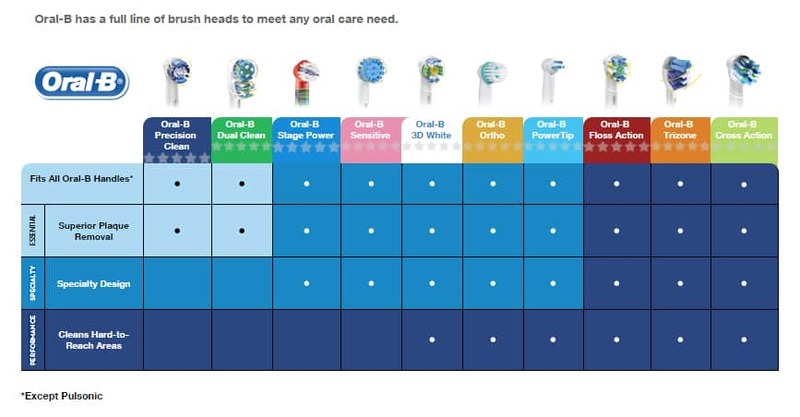 We have compared the two new models in our Oral-B Pro 2 2500 vs Pro 3 3000 post and recommend choosing between them instead of the older models compared below. Here is our comparison table for the newer models, and we also include the original 2500 vs 3000 comparison below. As with all our comparisons, we give you a quick answer first in case you’re in a rush, and then go on to explain our choice in more detail and provide a video comparison. In this post we are looking at the Oral-B Pro 2500 vs 3000. Two excellent brushes. We prefer the Pro 2500 box contents but the Pro 3000 just edges it on value for money and features as the additional cleaning mode is more valuable than the travel case. Despite the 2500 technically being inferior to the 3000 in the Oral-B range the limited supply makes the Pro 3000 generally the cheaper of the two. The Pro 3000 comes with 2 brush heads included (CrossAction & Sensitive) compared to the 1 (CrossAction) of the Pro 2500. The Pro 3000 comes with a brush head stand. The Pro 2500 has Black rubber front compared to the Blue of the Pro 3000. The Pro 3000 is generally the cheaper of the two. Detailed Comparison: What’s the difference between the Oral-B Pro 2500 Black and Pro 3000? I wish to start with a clarification. The Pro 2500 is often referred to as the Pro 2500 Black. They are the same product. Naturally, this limited edition colour is one of the obvious differences between the 2500 and the 3000. Both have the coloured rubber grip that runs down the front of the brush handle and a power button that is accented in white. The grip on the Pro 3000 is a Blue colour (darker than as seen on the Pro 2000 but lighter than the Blue rubber on the Pro 5000). Grips above and below the button are present and the rear of the brush handle is a gloss white plastic with hard plastic grips. A rubber back panel would be nice, but it is not essential and the grips stop the brush slipping out the hand, even when wet. Generally speaking, once you are used to the amount of pressure you need to apply then you will never illuminate the sensor or very rarely, thus making it almost redundant. From the images you may tell that both brushes look similarly sized and that is because they are. Identical in face. Both measure in at (with brush head) 23 x 2.5 x 3 cm and weigh 130g. Within this plastic body is the rechargeable battery which lasts approximately 28 minutes or 7 days, based on one user. To charge the brush, pop it on the charging stand (provided in the box) and leave it typically 8-12 hours for a full charge. The brush can be left on the charger even if the battery is not depleted, it will not do any damage; although it is recommended to discharge the battery fully every 6 months. The Pro 3000 comes with a moulded plastic attachment that sits around the charging stand. One of the differences in the box contents, this piece of white plastic has 2 prongs to the rear of it and these are designed for the 2 brush heads, that are included in the box to stand on when not in use. A neat way to keep the brush head with the brush, but there is no cover or lid over them like there would be on the storage compartment found with the Pro 5000 and 6000. A nice addition none the less. Whilst on the subject of brush heads, this is where the Pro 3000 has a one up on the 2500 as 2 brush heads are supplied in the box. Typically this is a CrossAction and a Sensitive head, although there is a Pro 3000 White and Clean branded option where 2 additional brush heads, both 3D White are included. Whilst a 3D White brush head can be used with the Pro 3000 and the 2500 and any other in the Oral-B Pro range, it is an odd package considering the Pro 3000 does not offer a whitening mode. So with the normal Pro 3000 coming with 2 brush heads, the Pro 2500 Black comes with just one, a CrossAction head. The inclusion of the Sensitive brush head fits in with the additional Sensitive cleaning mode offered on the 3000. Both share the Daily Clean and Gum Care mode, but the Sensitive option is available on the 3000 and in some cases is the mode that Dentists recommend over and above the Daily Clean mode as they feel it is less abrasive on the tooth surfaces. This Sensitive mode is better for those with sore, swollen or generally sensitive areas of the mouth. If you would like more cleaning modes, you will need to consider alternative brushes like the Pro 5000 or 6000. The various cleaning modes are explained here. There are a series of interchangeable brush heads available for these toothbrushes. Two other specialist heads also compatible include the Ortho and Interspace/Power Tip. Some of these brush heads are better suited to certain cleaning modes not found on the Pro 3000 or 2500 but can still be used. You can find out more about the different brush heads and what works best here in our detailed comparison post. The Pro 2500 comes supplied with a travel case, something not provided with the 3000. You can buy travel cases separately but they are not all that cheap. 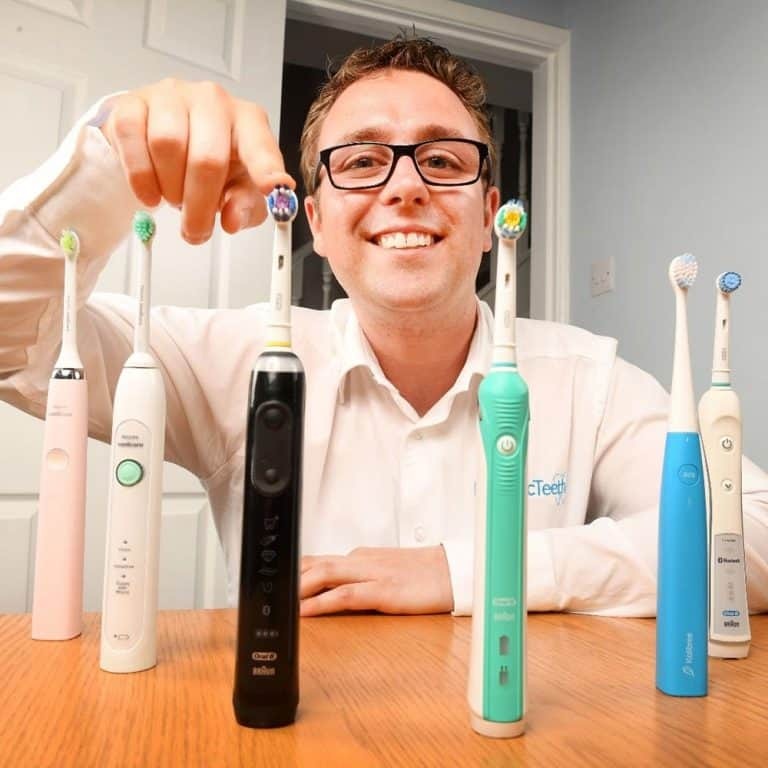 Reliable there brushes tend to be Oral-B do supply each with a 2 year warranty, which can be extended to 3 years, if you register the brush online. A feature that has not really been covered, nor well marketed, but exists, is something called sound connectivity. It is a novel feature if you can see your cleaning records, but the Bluetooth option found on the Pro 5000, 6000 or 6500 is more reliable if the idea of logging your cleans is of interest to you. SImply put no. An electric toothbrush will ensure a more regular and balanced clean across the teeth and mouth than manual brushing might, but it still relies on the user placing the brush in the mouth in all the right places to clean effectively. With the right technique and the regulated cleaning modes you can find either will leave your teeth feeling and looking healthier, but if you are using the Pro 3000 or 2500 on the daily clean mode, there is no known difference in their actual results; the only difference may be if you have specific needs whereby the Sensitive mode on the Pro 3000 will likely help achieve better results. Yes, the Pro 3000 works out to be fractionally better value, but there is not all that much in it. At the time of reviewing each brush with a full written review (links at the end of the post) each worked out at 7p per day based on 3 years usage by one person. However, at the time of writing this, the Pro 2500 Black is the more expensive and the Pro 3000 cheaper. This appears to be as a result of more retailers ranging the Pro 3000 compared to the 2500. Prices always vary and you need to weigh up the value to you at the time of purchase. Either brush may appeal to you for different reasons, but my pick between these two has to be the Pro 3000. When opting for a toothbrush cleaning modes take priority over the nice to have travel case which perhaps make the Pro 2500 appealing. The black and white design of the Pro 2500 is very crisp and will certainly appeal to many, but this limited design colour option actually results in the more premium brush being the slightly more expensive option. If the sensitive mode and matching brush head is of no use to you, rather than the Pro 2500 Black, you would be better off considering the Pro 2000. I bought the 2500 then I found this site, so back to the store I went and purchased the 3000. Yes it was a few dollars cheaper, but when I opened the package there is only (1) brush head in the box, the same as the 2500. I feel cheated out of the extra brush, but I’m not going to return it since it was still cheaper than the 2500. Marle, Glad to hear you managed to get the better Pro 3000 cheaper. Box contents can always change, its a shame it was not included. Let us know how you get on with the brush. Thanks for all your detailed information and Oral-B toothbrush comparisons. I’ve been using Rotadent toothbrushes for over 10-years (due to new owners they no longer offer lifetime replacements, however). Time for a change of brands and you are certainly a big help. Being one who tends to put too much pressure on the brush head, I am pleased to know Oral-B has solved that problem. So, I’m going to choose between the 2500 and the 3000, depending on which is easier to obtain from Amazon. Thanks so much! Hi Barb, thanks for th comment. Glad we could be of assistance. thanks; I really wanted to know how long between charges, based on two brushes a day. Which one hold the longer charge? Thanks for the comments. Bot the Pro 2500 and the 3000 have a 7 day battery life. So neither lasts longer than the others. Just 4 brushes or 8 minutes of usage times sounds extremely low for a brush. It could be faulty or is this perhaps an old brush that was not designed to last as long?